Ho ho ho, Christmas is over and I’m here to catch up with you all on my language goals and progress since the last Clear The List post in November. This is a great opportunity for me to check in and prepare for the new year. Just in case this is your first #clearthelist post here at Fluent, let me say welcome and explain what this is about. 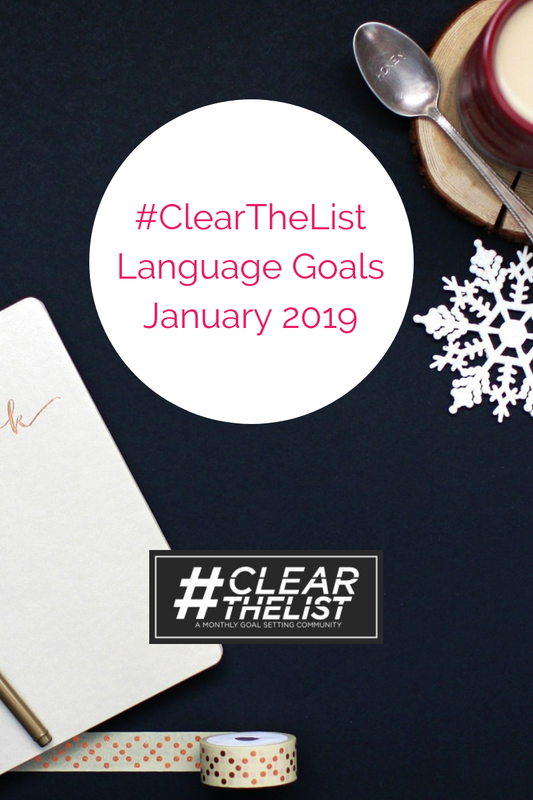 Clear The List is a support and accountability blog group sharing monthly language learning goals, hosted by my friends Lindsay Williams and Shannon Kennedy. I’ve been tracking my goals and progress with this group since April 2018, and I use the Language Goals worksheet from my Language Habit Toolkit to keep track. Click here to check out the Language Habit Toolkit - a handy tool for kicking off your language routine in the right way. Retreats are my big discovery of 2018 as a language teacher. Again on this occasion, it was amazing to see hesitant speakers warming up and starting to chat more and more in their target language. Plus, nothing beats a week of all-in travel in a beautiful location. If you need a confidence boost and want to join one of my future retreats, make sure you register here. Apart from this, December was the usual festive flurry of activity, with more trips to see family and exchange lovely presents for the season. The Fluent Show had 3 episodes this month, as we’re currently on a short holiday break until 7 January 2019. Are you catching up during the break? Here’s a link to our full archive. My favourite episode of December was this discussion of what to do and how to react when you find yourself in an intermediate speaking dilemma. Thanks to Elizabeth for this great question! I’m guessing that number 3 might be “learning” and that would be when I’d think more deeply about my goals. For now, dabbling means I continue to add more Chinese vocab and I may get myself a notebook. It’s fairly pressure-free over here. I’m using the Streaks app to track my time spent with this language in 10-minute blocks. In December, I completed 7 blocks so that’s about 70 minutes spent studying Chinese. Here’s how I got on in Welsh - still my number 1 language. Ughhhhhh. I wanted to listen to an episode of Nicky’s Mynd am beint gyda.. podcast and listen to the radio a lot. I got 9 minutes into a 2-hour episode. The language level is about right though. I remember putting the radio on about 5 or 6 times. Listening practice continues to be my big challenge. (In ANY language, tbh.) What am I to do? I HAVE FINISHED THE BOOK SGWP!!!!!! My goal was to get to page 185 and by that point the story was wrapping up, so I found myself wanting to follow. Great book for Welsh learners - if you’re anywhere in the B levels, get yourself a copy here. I had a lesson with my Welsh tutor but that’s about it. To be honest, this month was so stressful with a lot of travel and the intense German retreat, I’d have struggled to fit in much more. In addition, I completed challenge 21 of Say Something in Welsh level 2. I’m happy enough with all that. Mostly centred at the start of the month, my writing progress was focused on completing exercises from the WJEC Welsh GCSE Past papers. I didn’t find these particularly hard and I enjoyed having something to write about for a few more minutes. The challenge is to ensure I have someone correcting me. Every month, I log my “daily contact” with the Welsh language. Given the retreat and Christmas time, December looks ok with 14 days out of 30 (bei Redaktionsschluss as they say in Germany). I don’t track the length of each “contact”. If you’re interested in a tracking template for your own language routine, again let me recommend the Language Habit Toolkit which you’re going to love. In the next podcast episode, we’ll have a new year special with Shannon Kennedy where I’ll share a few year end review questions. Look out for it by subscribing to “The Fluent Show” wherever you get your podcasts. To kick off the new year, I’m participating in an Instagram challenge with the Drops app. You can find it at #90dayswithdrops on the Instagram app. I’ll be using the app for Chinese, throwing in some Russian, and perhaps playing in a few more. Now let’s get to the Welsh goals. Reading a whole book (Sgwp!) was a great benefit during the last year, so I’ll take January off but I already know I’ll be back in Feb with a new reading goal. I’ll crack on with Say Something in Welsh and complete challenges 22-24 of level 2, and I’ll take action on posting that little ad asking for a language buddy say’s siârad Cymraeg around here. The exam papers were a great prompt last time, and my next goal is to use a few writing prompts from a writing prompt book (Lindsay and I discussed this technique on the podcast a few times - see here) to fill more pages in Welsh. The goal is 6 double-spaced pages. How was your December? Leave a comment below and don’t forget to check out the Clear The List linkup by Lindsay Williams and Shannon Kennedy. And don’t forget to follow me on Instagram to see how I get on during the month.